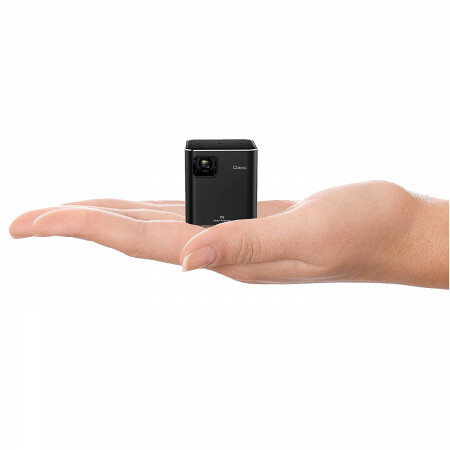 The mini projector Orimag P6 is so small that it fits into your pocket. 110 g, 80 ANSI lumens and wireless connection. Complete mini projector of awesome quality. Should you have a presentation in the job or school? Put the mini-projector in the jacket pocket and project your PowerPoint! This ultra-compact mini-projector of just over 100 grams is so small that you can put it in your pocket. But don't be fooled by the format, it's definitely no toy. Inside this small projector is a high-quality DLP circuit that provides great color reproduction and extremely long life on the LED lamp. The brightness in relation to the size of the projector is striking, a total of 80 ANSI lumens. The projector has built-in battery and speakers. So you can view photos, video clips or presentations anywhere! Orimag P6 is compatible with Android and iOS phones, as well as Windows 10 computers wirelessly. In addition, the device can play content directly Micro memory card. You can also connect external speakers with 3.5mm if you want better sound. https://www.e-ville.com/en/3045470-projektorit/30226-rimag-p6-mini-projector.html 30226 Orimag P6 mini projector http://www.e-ville.com/img/p/30226-148071-fb.jpg 221.95 GBP InStock /TV ja kotiviihde/Projectors/Projektorit /TV ja kotiviihde/Projectors /TV ja kotiviihde The mini projector Orimag P6 is so small that it fits into your pocket. 110 g, 80 ANSI lumens and wireless connection. Complete mini projector of awesome quality.